Orientations, training and safety measures for volunteers have been developed greatly as the activities have proceeded over the past six months. Read here for further information about such issues. Peace Boat puts great effort into preparing volunteers by training them thoroughly before going to the disaster-affected areas, including compulsory safety training. 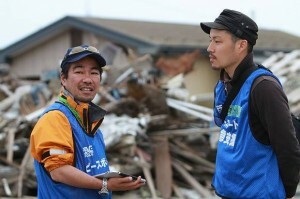 Many volunteers are still needed in Wakayama Prefecture, where Peace Boat Disaster Relief volunteers are working on relief following Typhoon #12. On September 11, 6 months after the Great East Japan Earthquake and Tsunami, 10 high school students from Tochigi Prefecture came to help with Peace Boat's debris removing volunteer activities. 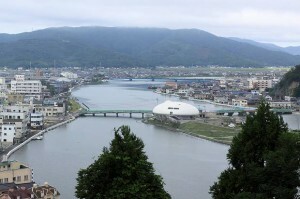 Second in a series of photographs of scenery in Ishinomaki, this time by photographer Kataoka Kazushi. Taylor Anderson was an assistant English teacher from the US who lost her life in the tsunami. 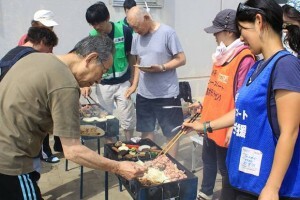 4 members of her family volunteered with Peace Boat in her beloved Ishinomaki on September 8. On September 9 approximately 30 volunteers participated in the Festival at Hayamahime Temple Festival Temple, which is located in the Oginohama area of the Oshika Peninsula. Slate stones are a traditional industry of Ogatsu town, near Ishinomaki. Volunteers have been working to collect them to be reused for things such as roof tiles, accessories and ink stones. 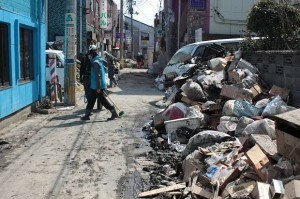 Peace Boat has completed cleaning of over 1,200 locations in Ishinomaki, including homes, shops, schools, drains and cemeteries. These photos show scenes before and after volunteer efforts. 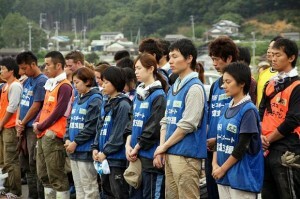 At 2:46pm on September 11, six months since the Great East Japan Earthquake and Tsunami, all volunteers and staff together held a moment of silence to pray for the souls of those who lost their lives. Peace Boat first met Mr Nakazato on July 2 at the Ogatsu Recovery Market. He is a fisherman in Funakoshi, a small village of 320 people before the disaster where the tsunami destroyed most homes. Recently volunteers have become busy with cleaning graves and the surrounding areas, as local residents have requested help to have the graves cleaned by the time of the coming equinox. 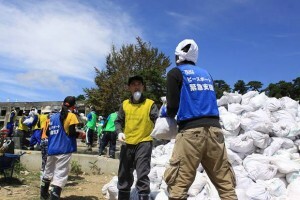 The "Dani-buster" team been working since June, and is in charge of cleaning bedding, pest control and in particular removing bed bugs in the more than 60 evacuation centers in Ishinomaki area.